In an interview prior to the release of Praana, director V. K. Prakash gave a disclaimer that the thriller movie is not based on late journalist Gauri Lankesh’s life. In fact, scriptwriter Rajesh Jayaraman had penned the script ‘way before her untimely death’. Disclaimers aside, Praana, which features only one actor—Nithya Menen—has carefully imbibed many real-life incidents and lays bare horrifying truths. The real success of Praana depends on how precisely the audience comprehends the hidden layers of the two-hour psychological thriller. 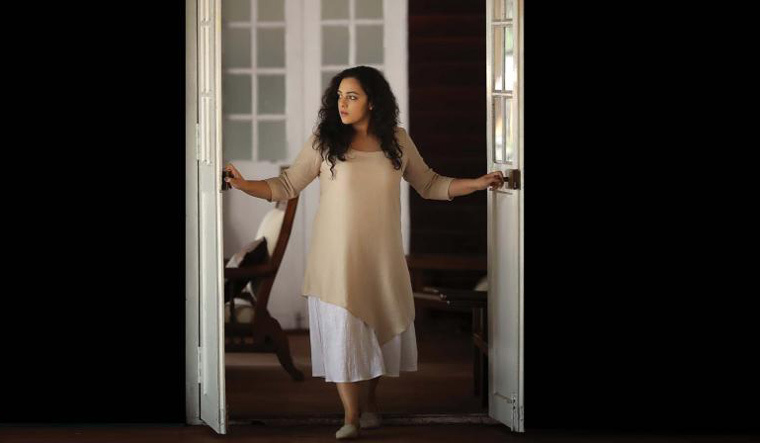 Nithya Menen appears as Tara Anuradha, an outspoken writer who is known to express her views on social issues. As the movie begins, we hear her talking about the freedom to eat, wear the clothes we like and love the person of our choice. You cannot help but think of incidents that have been the subject of heated debates in recent times. Though Praana starts off as a usual horror thriller, it slowly takes another form and introduces its underlying concept. The first half, trying to establish a stand, may feel like a drag. The second half, however, makes up for it with twists and shocking revelations. Without any onscreen violence, the solo drama shows how people who stand up for freedom are mentally and physically tortured and attacked. While symbolism is at its best in the film, Tara’s powerful dialogues drive the point home. In a commendable performance, Nithya Menen stresses each word while she delivers them with a pinch of pain and strong resentment. Although her conclusion is an oft-heard phrase, it leaves you thinking again— Marendathu samoohamalla oru vyektiya [It is not the society that needs to change, but the person]. Throughout the movie, she reiterates that each one of us should stand up for freedom and that is what she intends to do through her book, Music of Freedom. Praana ends with ‘Your life is important’ and leaves you in awe of the crew for putting forth the message through a rather unusual genre. Sitting through the credits, you will definitely run a Google search on the crew behind the amazing sound effects. Oscar-winning sound editor Resul Pookutty has worked his magic, successfully experimenting with live surround sync sound for the first time ever. Pookutty's format has captured every minute detail of Tara's movements, and lets you slip into her skin, listening to the sounds just as she would. Even though the movie does not give you too many jump scares, it manages to keep you on the edge of your seat—all credit to the engaging sound effects and visuals. Distorted visuals, unusual camera angles and few first-person perspectives by P.C. Sreeram are Praana's strengths. Arun Vijay's background score and music by Louis Banks bring in a breath of fresh air. Praana released in four languages—Malayalam, Tamil, Telugu and Kannada.